Have you heard about the hottest new couple? No, it doesn’t involve a Kardashian, but the duo certainly has a knack for turning heads. Their names are History and Technology. Wait — don't yawn and walk away yet. Okay, it is true that History and Technology are always together, both sharply at odds and wonderfully collaborative (like any couple). But this pairing now has something to offer that has previously been inconceivable: augmented reality (AR). Remember the View-Master? Put it to your eyes, point it toward light, and a magical, three-dimensional scene appears, bringing you right into it. Fast forward to today, and imagine the scene being in the Former Governors’ Mansion. In the Mansion, portraits of governors hang on the walls. The house includes a 1910 Steinway piano, architectural features such as a widow’s walk, and mysterious burn marks on the kitchen floor. What if you could point a device toward a governor’s portrait and hear his inaugural address? Or hear the Steinway playing “Bicycle Built for Two,” a song popular in 1893 when the first of 20 governors lived in the Mansion? Well, this summer you will be able to. An app that features elements of AR allows visitors to point their phone to a “trigger” and watch or listen as history comes to life. Let me walk you through an example. Using a portrait of Governor Shortridge as a trigger, I can access his 1893 inaugural address (read by historian Dr. Barb Handy-Marchello) on my tablet (Johnathan Campbell). Step 1: Take a picture of a trigger. In this case, Governor Shortridge’s portrait. Step 2: Invite a voice actor to read and record a snippet from the inaugural address. Save the audio file. Step 3: Find a few photos from the State Archives of Governor Shortridge and his family and the old Capitol from 1893. Step 4: Using iMovie or a similar program, upload the photos and the audio file. Create a slideshow with the photos to match the length of the audio file. Step 5: Upload and save this movie to Aurasma Studio, free web-based software. 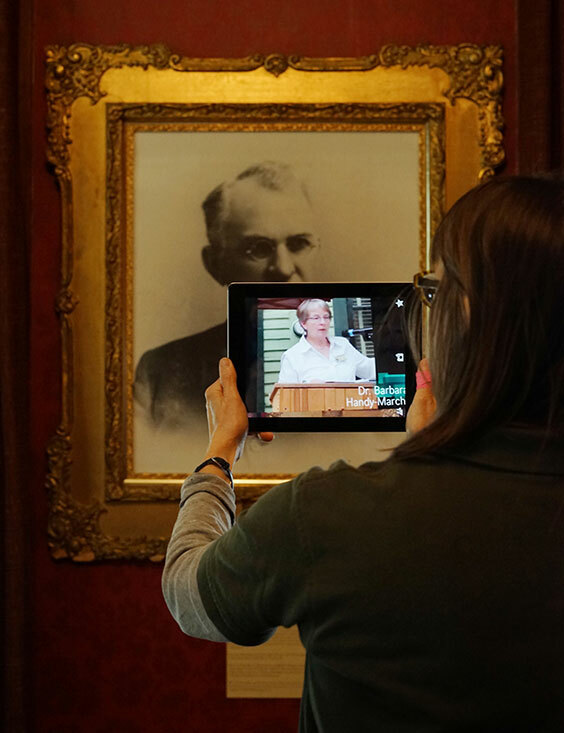 Step 6: Visitors who have downloaded the free Aurasma app to their device can open the app and point the device to the trigger, Governor Shortridge’s portrait. Step 7: Look at the screen of the device: The movie/slideshow with audio of the inaugural address begins to play! 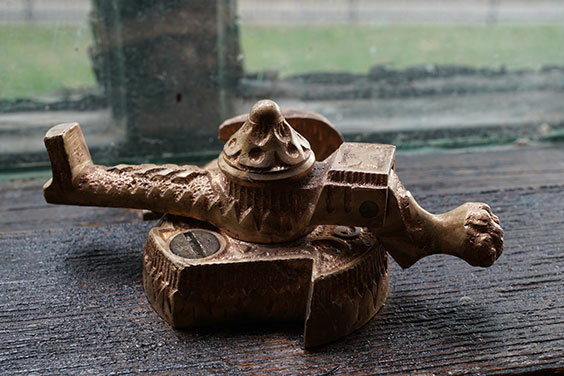 This original window lock dates to 1884. It is one of many objects that could be a potential “trigger” for your AR experience at the Former Governor’s Mansion (Johnathan Campbell). That is a very basic Aurasma “aura” (projects in Aurasma are called auras). For something more exciting, what about the view from the roof? Johnathan Campbell, site supervisor and photographer, shot panoramic footage from the Mansion roof. After uploading it to my laptop, I obtained archival photos showing aerial views of Bismarck from the early 1900s. I arranged the video footage and photos in an iMovie file and uploaded it to Aurasma Studio. When visitors point their device to the trigger (an image somewhere inside the Mansion), they can enjoy a beautiful panoramic rooftop view from the past and today without scaling the 133-year-old attic ladder. If you’d like to step inside the AR time machine (figuratively speaking) and catch a glimpse of today’s hot new History and Technology couple, you will be able to starting in July at the Mansion. In addition to the ones described, some of the AR adventures will include piecing together what caused the burn marks on the floor, watching the original Capitol fire from the Mansion back porch, and watching the demonstration in 1934 in protest of Governor Langer’s removal from office. 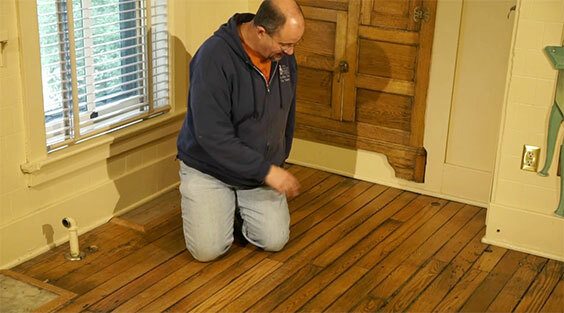 Site supervisor Johnathan Campbell interpreting burn marks on kitchen floor (Johnathan Campbell). So keep your teleportation device at home and bring your phone or tablet to the Former Governors’ Mansion. We are finding ways for you to go back in time!